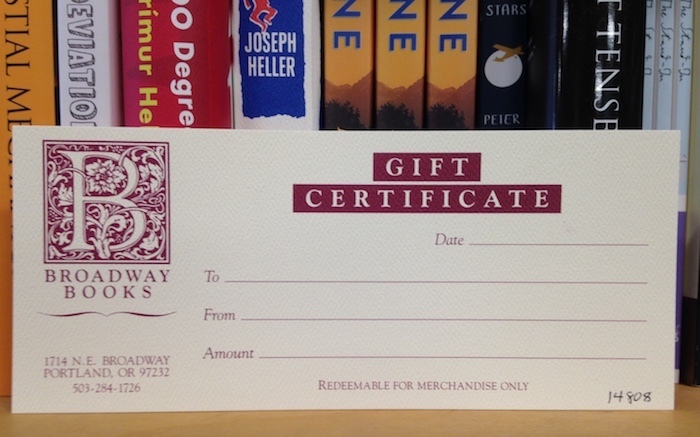 Broadway Books Gift Certificates can be made for any amount, and they never expire -- if we don't expire, they don't expire! We are happy to mail gift certificates anywhere -- postage is on us. Our hand-lettered gift certificates make fabulous gifts that add a personal touch when you're just not sure which books to give someone. You can order them on-line in the denominations listed below. If you would like to order a gift certificate in a different amount than those listed, just give us a call at 503-284-1726. At this point in time, gift certificates cannot be cashed in online. If you want us to mail them to someone, please provide the mailing address in a separate email to the store: bookbroads@qwestoffice.net.